WLCG REBUS is the live list of all the WLCG-contributing sites at Tier-0, Tier-1 and Tier-2 level. You can share and download this map. It is automatically updated. Click on the [ ] to see map full-size and for sharing/download options. Live dynamic map in Google Earth. Shows all WLCG live grid sites (Tiers 0, 1 & 2), links, data transfer and job activity over the last 10 minutes. 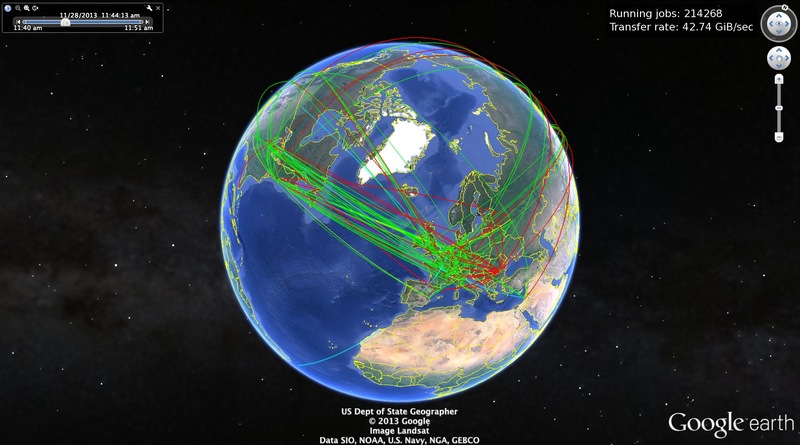 The LHC Optical Private Network also has a Google Earth real-time dynamic map showing transfers between CERN and the Tier 1s. Images are available for free download. Please see conditions of use HERE.